I´m using an Arduino Diecimila to control the steering servo and the traction motor. The XBee module receives data from another Arduino, this one has a wii nunchuck controller attached. I forgot to tell a little story about this little and nervous fellow. 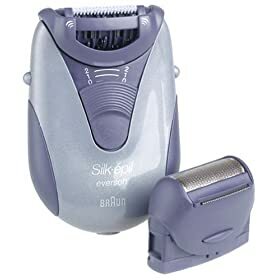 One day my mother told me she had one hair-removal thing broken (Braun Silk Epil brand ), and she said that she would bring it to me so that I fixed it. This made me think a lot on how could I twist it and use it to give life to a robot. The most difficult part was to transform the front blades onto a wheel, I did it using pieces of bike air-chamber, rubber and hot glue. I like the final result and it works quite well! Could you post the code for this? I’ve been trying to get my xBee communications working for a while, but am having trouble reading the strings. It might help a lot if I could see how you did it.